Lately the Bee has been really into coloring. 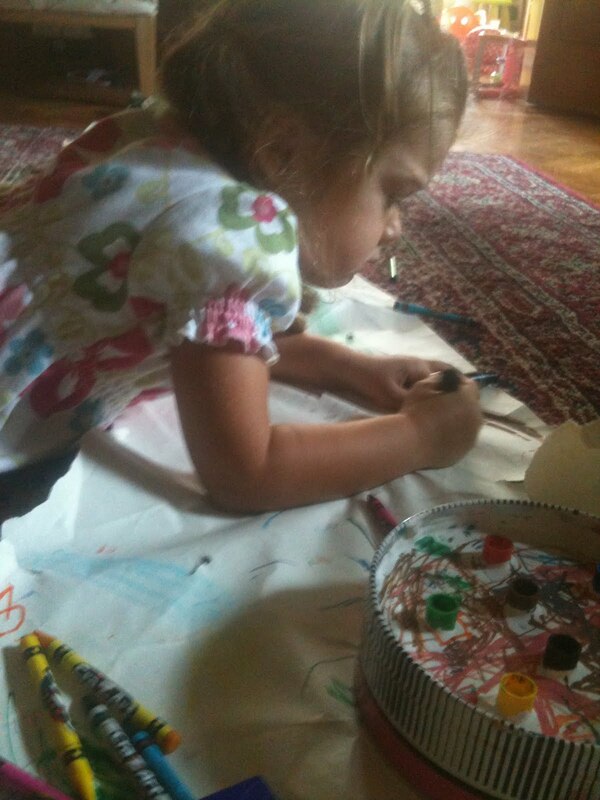 She has particularly been into coloring with markers. A few months ago we made a cool marker holder that makes it easier for young kids to get out and put away markers on their own. I first read about this marker holder on The Artful Parent (http://artfulparent.typepad.com/artfulparent/2010/10/marker-holder-love.html) but the idea originally came from a great book called First Art: Art Experiences for Toddler and Twos by Mary Ann Kohl. The girls love the marker holder and we have used it almost daily. We have used this marker holder so much today i decided to make a second one. 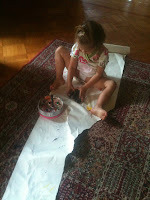 The first one we made using an old cookie tin for the base and regular washable crayola markers. The only problem with this is that now crayola makes all their washable markers using recycled plastic, which i would not normally see as a problem, however the recycled markers are all black. Which means that if you can't read you can't tell what color the marker is just from looking at it. So today we made a second marker holder using Crayola Pip-Squeak markers which still have the colors on the marker body and cap. We used a wooden box left over from a Melissa and Doug toy the Bee got for her birthday. To make the marker holder we begin by mixing up some plaster of paris to the consistency of a thick pancake batter. We then poured it into the base of the wooden box filling up the entire box. Quickly before the plaster set up we placed the cap side of the markers into the plaster and let the plaster dry. After a few hours the plaster had dried and our new marker holder was ready to use! The girls of course loved the new marker holder and spent a long time not just coloring with the markers but also matching the colors of the markers with the caps colors. The Bean mostly enjoyed just trying to put the markers back in the holes, regardless of color. Another benefit to the new marker holder is that the pip-squeak markers are a little shorter making it easier to store on a book shelf. This is an awesome idea! My (almost) 2 year old loves to use markers like his big brother but it is always a hassle and I'm always worrying that he'll put the caps in his mouth. This is a great solution... and I love the way you repurposed the M &D crate. is Bean one of your daughter's nickname? my nickname is bean! my sister gave me a tiffany bean necklace for college grad! all images and text are copyright and can not be reproduced without written consent. 29) When Did You Get So Big? 21) How Did Mom's Do It Before The Internet? What's on Your Childhoo List? 1) What's on Your Childhood List?